If you are like anyone else trying to fit pancakes into your healthy lifestyle, then you may have noticed that a lot of the recipes fall flat, literally. From pancakes that taste as chalky as your elementary school teacher’s chalkboard or ones that taste literally like the flour they are made out of which we all know is not that exciting. Pancakes are a fun way to welcome the weekend and no one wants to start out their weekend disappointed. Well, be disappointed no more by adding cassava flour to your pantry. And what is cassava flour you might add? You’ve probably heard of tapioca flour before, which is actually made from starch extracted from the cassava root, but tapioca flour only acts as a filler in gluten-free baking. The problem with a lot of gluten free flour alternatives is that a lot of them are fillers and not bases. Cassava flour is a whole food that retains all of its fiber and can actually be used as a base in all of your baked goods. Yay, Cassava flour. Wait, I still haven’t told you exactly what cassava flour is. Cassava is a root vegetable, similar to yams or taro. It is gluten-free, grain-free, and nut-free, which is great news for all people dealing with multiple allergies and/or sensitivities. There aren’t many guessing games when it comes to cassava flour, you substitute cassava flour 1:1 for wheat flour in almost any recipe. The flour is powdery with a fairly neutral taste and a slight hint of nuttiness. Cassava flour does absorb more liquid than all-purpose flour, which means you might need slightly less of it or slightly more liquid but keep mind with the later you could yield with more batter. Try to experiment with some recipes that are familiar to you to get a feel for using the flour. 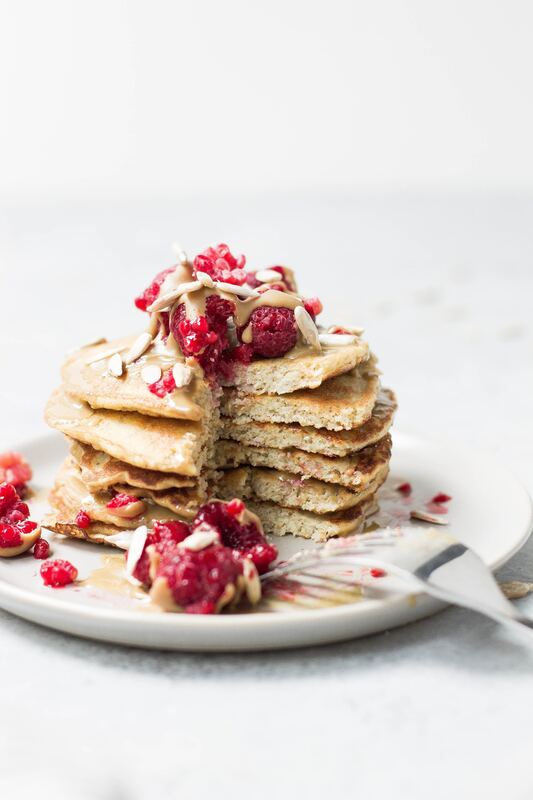 But the best news yet is that cassava flour yields a super-fluffy texture to pancakes and baked goods, which as you already know, is super hard to come by in gluten-free flours. To start off on your cassava flour pancake journey, try this recipe on for size. In a large mixing bowl, whisk eggs until they’re well-beaten. Add with the eggs the oil, milk alternative, and maple syrup, stirring until all ingredients are all mixed well together. Next, add the cassava, baking soda, salt, and cinnamon. Mix until a batter forms without clumps. Grease a large skillet over medium heat. Add a small saucer circle of batter to the sizzling pan. Cook for 1 to 2 minutes per side, or until golden brown. Let’s Live the Weekend a Little bit Longer with Protein Pancakes!